Today we’d like to introduce you to Michael and Tempa Kohler. In 2008, Tempa and her husband Michael began thinking about plans for their son Bradley (born with Fragile X Syndrome) for after he turned 22 years old and aged out of county supported programs. They were trying to determine what jobs would be best for him as a special needs adult. As they were looking, they realized that there weren’t that many options available for adults with special needs. 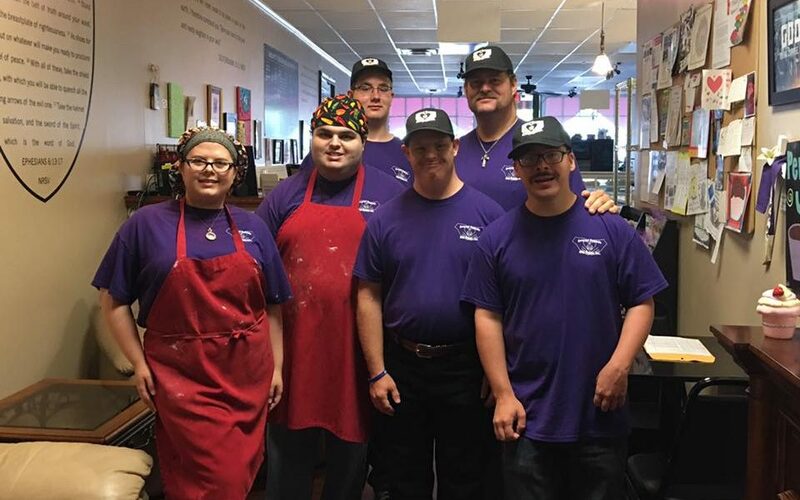 They began to feel that God was giving them a vision for a bakery that would employee special needs adults and also impact their community in a positive way by providing free birthday cakes for children whose families could not afford to purchase one. Seeing as how Tempa has been baking and decorating since she was 13, they got excited about doing this with their lives, and there were other people who began to get excited and dream along with them. Six years later their dream became a reality, they leased the building, hired the original staff, and opened on January 23, 2014 which also happens to be Michael’s mother’s birthday. The opening was so exciting. Their first customers through the door were a special needs group out on community skills that had no idea that they had just opened. The rest of the day was filled with excitement and memorable moments that finished up with their last customers of the day being a young couple with their wheel chair bound child that had chosen to have dessert rather than dinner for their anniversary as they could only afford one. It was confirmation from God with these bookends on their first day that they were following HIS will for their lives. There were challenges for them along the way too. They were training a new staff and trying to keep up with the orders that were flooding in. Learning how to run a business along with all the demands it required. Special Kneads and Treats has grown so fast and they now have 16 special needs adults in meaningful, gainful employment along with 4 that volunteer and another 150+ on a waiting list. A lot of special things happen during a typical week for them. Approximately 600 customers come through the door resulting in almost 1,800 cupcakes being sent out along with various other cakes, cookies, choc-corn, and many other sweet treats. Sometimes up to 20 free birthday cakes are provided as well as many donated sweets to various other non profits and specialty groups in support of special needs or those less fortunate. Some of the important things that special needs do on a weekly basis are placing stickers on just about anything you can imagine like bags, boxes, cups, lids, containers, etc. They help with laundry, cleaning and stocking, folding boxes, preparing recipes, decorating products and even assisting customers and in some cases running the registers. They are honored that their work has caught a good bit of media attention over the last 3.5 years from the local news stations as well as National News and likewise with several media publications. This media coverage has opened their eyes and hearts to the realization that there is a huge need for the services they offer not only in their community but in all communities across the country. They have had a wonderful 3 years and 4 months, but now they believe that God has placed a new and bigger vision in their hearts. They envision a larger facility where more special needs can be employed that is more suitable for those requiring wheelchairs and walkers along with the ability to produce more products in support of the less fortunate and in need which could also be utilized as a distribution point feeding into small store fronts in most of the surrounding cities which in turn would allow for more special needs employment and community outreach. They have procured a mortgage on a larger 11,000 square foot facility just about 8 blocks from their current space on the Lawrenceville Square. This could not only provide for what was stated above but also could open up more special needs employment opportunities that could include the ability to start shipping their product along with the capacity to handle larger contracted orders by stores and businesses that may wish to sell their branded products. They are excited for the next phase of their journey to provide special needs adults with a meaningful job that encourages a sense of purpose and pride. They would love for you to be a part of their Special Community. The largest challenge much like any non profit is funding. We also find that many people do not truly understand what being a non profit means and that doing too much retail is not a good thing for a non profit status. Also with our business model of hiring special needs adults people tend to overlook the fact that our core mission is actually trying to ensure that local children that have a birthday and cannot afford birthday cakes gets one free from us. We also find it challenging that we want to help so many more special needs adults and with a wait list over 160 we just cannot help them all. Now with the new facility we are poised to help many more in our community and within the special needs focus but funding is at a premium and without monthly recurring support we will not be able to grow much at all. So, as you know, we’re impressed with Special Kneads and Treats, Inc. – tell our readers more, for example what you’re most proud of as a company and what sets you apart from others. Special Kneads and Treats, Inc. is a 501(c)(3) nonprofit with a core mission to try and ensure that any child in our community that has a birthday whose family cannot afford a birthday cake receives one FREE from us. We produce cakes, cupcakes and other sweet treats. We are most known for our choccorn which is a premium white chocolate covered puff corn product that is made by our special needs and is very addictive. It is gluten free and with no hull or kernel is something that will not bother diverticulitis. We are very well known for our efforts in employing adults with special needs and working from a first come first served mentality where the disabilities are not looked at. Most business models hire mostly high functioning special needs and there are so many that may have extremely limited motor, verbal and cognitive skills even to the point of having a parapro or job coach assigned to them. We are extremely proud of the fact that we provide a paycheck to 16 special needs adults and with more funding are hopeful to increase this number tremendously. What sets us apart from other nonprofits is that we are trying to provide a retail type of environment for the portion of our special needs that can handle the faster paced setting of a store front. What sets us apart from most bakery environments is that we are a non profit that focuses on free cakes to children as our nonprofit mission. The Atlanta area is so diverse and offers just about anything you can imagine for people from all walks of life. There are so many things that a person can do in the area and if you just do a little research on any type of hobby or interest you are sure to find much more than most other city environments. The least liked thing about Atlanta is the sheer volume of traffic everywhere you go. With so many people and so much to do it seems like everywhere you go there is a wait or line so you just get used to it.